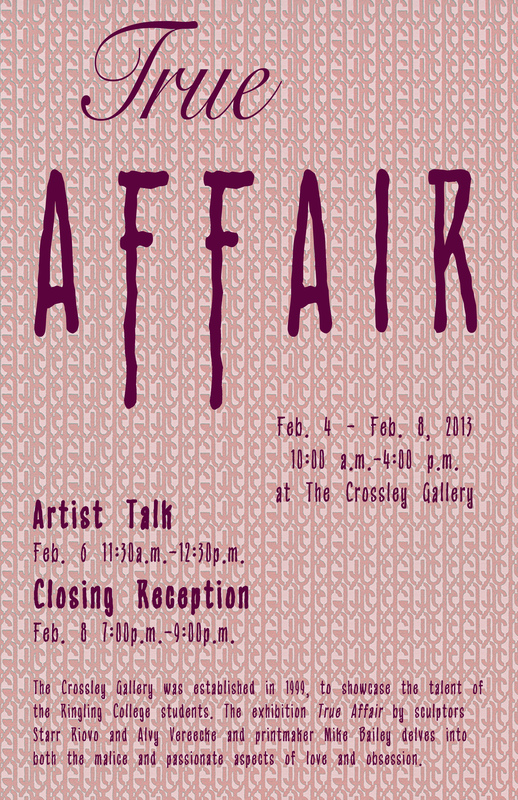 True Affair, an exhibition of works by sculptors Starr Riovo and Alvy Vereecke and printmaker Mike Bailey, will be on display in the Crossley Gallery February 5 – 8, 2013 between the hours of 10:00 a.m. and 4:00 p.m. In any relationship there is a light and dark side. Places of refuge and security can become hostile. Love, once sweet and calm, can erupt in rage with a passion to keep the loved one close while adoration is slowly replaced by a fatal attraction. The work exhibited by sculptors Starr Riovo and Alvy Vereecke and printmaker Mike Bailey delve into not only the malice but also the passionate aspects of love and obsession. The works in True Affair are a depiction of how each artist has been driven to act and react within their own relationships. Starr Riovo talks about understanding a relationship by investigating her own relationships and exposing the raw emotion. Alvy Vereecke explores the environment of a home where sanctuaries can twist into combative and fiery forces. Places of harmony are transformed by lovers, family and friends. They can become battlegrounds invisible to an outsider. Through his choice of corporate logos, Mike Bailey explores the message behind the visual. His work encourages the viewer to consider one’s own response to corporate logos they no longer “see” and reconsider how one might respond to them. There will be an ARTIST TALK February 6, from 11:30 a.m. – 12:30 p.m. in the Crossley Gallery, providing the public an insight into the artists’ work. The exhibition will conclude with a reception Friday, February 8, 2013 from 7:00 – 9:00 p.m.